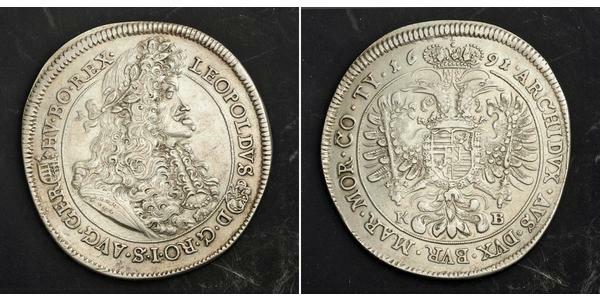 1691, Kingdom of Hungary, Leopold I "the Hogmouth". 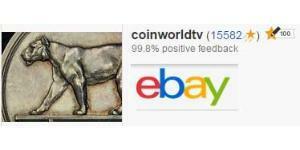 Large Silver Thaler Coin. 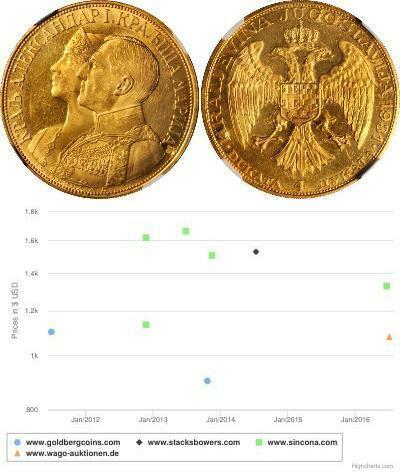 Kremnitz mint! 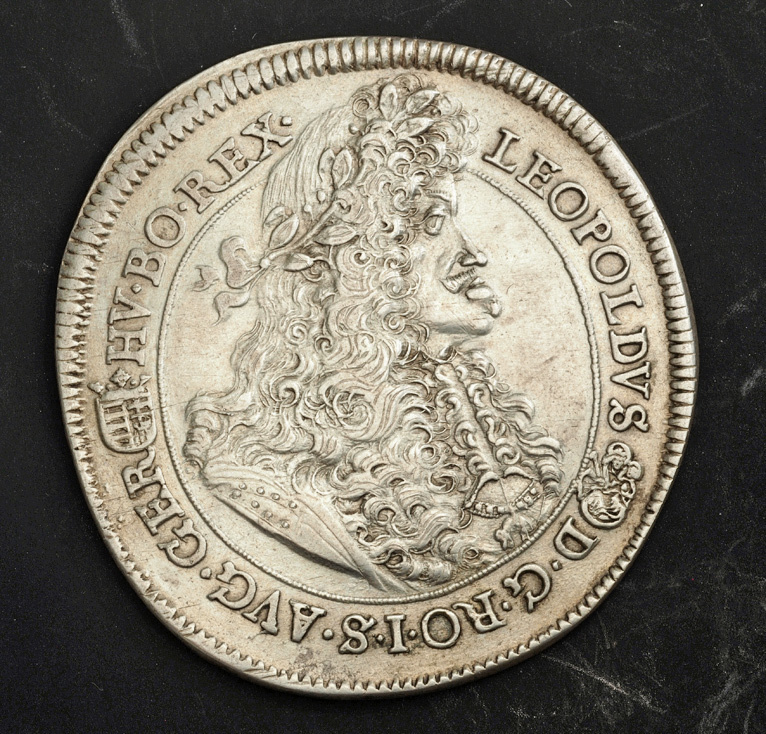 Obverse: Laureate and armored bust of Leopld I right, wearing Order of the Golden Fleece. Monster-face in shoulder drapery! 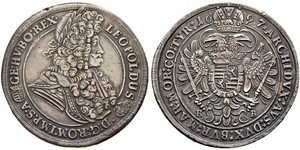 Legend: LEOPOLDVS (Madonna and Jesus child) D: G • ROM • IMP • S • A : (Hungarian coat-of-arms) GE : HV : BO : REX Translation: "Leopold, by the grace of God, Emperor of the Romans, Ever Augustus, King of Germany, Hungary, and Bohemia" Reverse: Crowned double eagle holding scepter and sword, coat-of-arms within Order chain on breast, K B across fields. 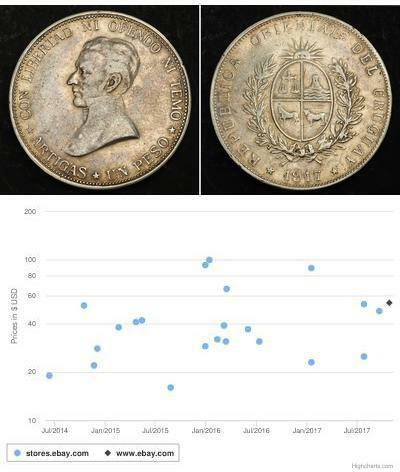 Legend: AARCHIDVX + AVS+ DVX+ BVR+ MAR+ MOR+ CO+ TY+ 16 - 91 + Translation: "Archduke of Austria, Duke of Burgundy, Margrave of Moravia, Count of Tyrol 1692." 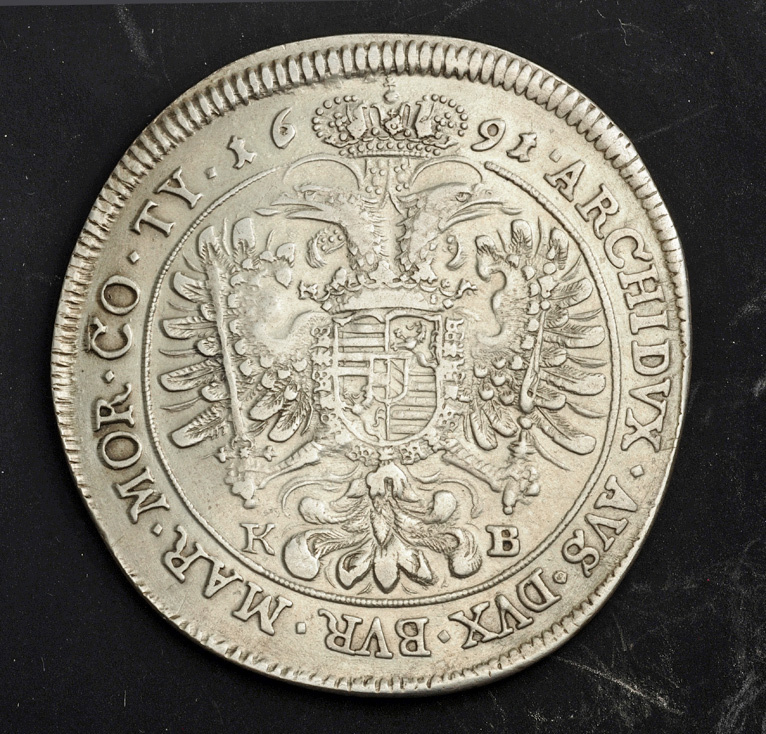 In the Holy Roman Empire, the Thaler was used as the standard against which the various states' currencies could be valued. In 1672, however, he was forced to take action. He entered into an alliance for the defence of the United Provinces during the Franco-Dutch War; then, after this league had collapsed owing to the defection of the elector of Brandenburg, the more durable Quadruple Alliance was formed for the same purpose, including, besides the emperor, the king of Spain and several German princes, and the war was renewed. At this time, twenty-five years after the peace of Westphalia, the Empire was virtually a confederation of independent princes, and it was very difficult for its head to conduct any war with vigour and success, some of its members being in alliance with the enemy and others being only lukewarm in their support of the imperial interests. Thus this struggle, which lasted until the end of 1678, was on the whole unfavourable to Germany, and the advantages of the Treaty of Nijmegen were with France. Almost immediately after the conclusion of peace Louis renewed his aggressions on the German frontier through the Réunions policy. Engaged in a serious struggle with the Ottoman Empire, the emperor was again slow to move, and although he joined the Association League against France in 1682 he was glad to make a truce at Regensburg two years later. In 1686 the League of Augsburg was formed by the emperor and the imperial princes, to preserve the terms of the treaties of Westphalia and of Nijmegen. The whole European position was now bound up with events in England, and the tension lasted until 1688, when William III of Orange won the English crown through the Glorious Revolution and Louis invaded Germany. In May 1689, the Grand Alliance was formed, including the emperor, the kings of England, Spain and Denmark, the elector of Brandenburg and others, and a fierce struggle against France was waged throughout almost the whole of western Europe. In general the several campaigns were favourable to the allies, and in September 1697, England, Spain and the United Provinces made peace with France at the Treaty of Rijswijk. To this treaty, Leopold refused to assent, as he considered that his allies had somewhat neglected his interests, but in the following month he came to terms and a number of places were transferred from France to Germany. The peace with France lasted for about four years and then Europe was involved in the War of the Spanish Succession. The king of Spain, Charles II, was a Habsburg by descent and was related by marriage to the Austrian branch, while a similar tie bound him to the royal house of France. He was feeble and childless, and attempts had been made by the European powers to arrange for a peaceable division of his extensive kingdom. 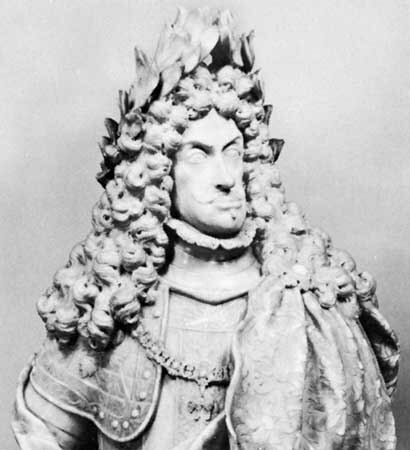 Leopold refused to consent to any partition, and when in November 1700 Charles died, leaving his crown to Philip, duke of Anjou, a grandson of Louis XIV, all hopes of a peaceable settlement vanished. Under the guidance of William III a powerful league, a renewed Grand Alliance, was formed against France; of this the emperor was a prominent member, and in 1703 he transferred his claim on the Spanish monarchy to his second son, the Archduke of Austria, also known as Charles III of Hungary. The early course of the war was not favourable to the imperialists, but the tide of defeat had been rolled back by the great victory of Blenheim before Leopold died on May 5, 1705.